I was with some girlfriends the other day and, because we are in the throes of parenting everything from newborns to preteens, we inevitably started swapping kid stories. I'm the kind of girl who likes the real stories - the ones that aren't perfect and tidy or make our kids look like saints. I much prefer hearing how your kid colored on the wall, ate the dog's food, or ran away from you at the grocery store. I like these stories because I can always relate to the messiness of life a little better than a picture-perfect life. Sure, hearing that your kid did that horribly-embarrassing thing makes me throw my head back and laugh, but do you know what it also does? It reassures me that man...none of us get it right all the time. None of our kids are perfect, none of us are perfect parents, and, for the most part, we are all doing our best at this hard but necessary work of parenting. So it was during this story-swapping time when I shared with my friends about this weird idea I started implementing in our home a few years ago. At the time, my boys were 10, 8, and 7 and ohmygosh did they fight. I was beyond frustrated. I had done all I knew to do - I'd prayed, cried, grounded them, taken privileges away from them, threatened to homeschool them again (I have no explanation for this; it was an empty threat) and then I prayed some more. I was at the end of myself. I threw up my hands one day, looked heavenward, and said out loud, "God, I don't know what to do anymore." It's usually in those moments when I feel completely undone that God sees a clean canvas he can work with. Oh friends - He really does love to prove himself strong in our weaknesses. It was there in the middle of my mess that I felt the Lord clearly prompt me to battle for my kids with the Word. And so I did. My early morning times became this battle zone where I started praying specific, written out prayers for my boys. The prayers became rhythmic, the verses engrained in my mind throughout my days. Then I started going into their rooms at night after they were asleep and praying those verses over them. 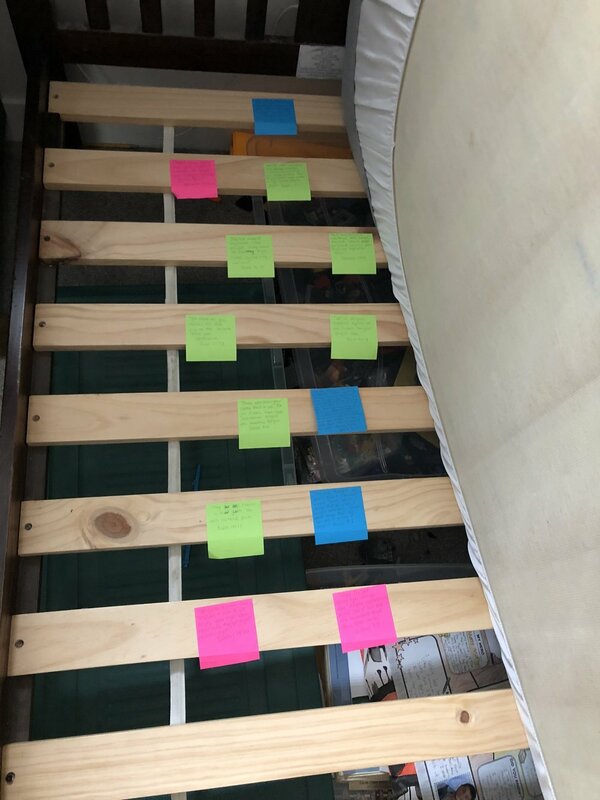 This prompted the next slightly weird idea that I shared with my girlfriends not long ago: I started taping those scriptures under their beds. Listen, I'm not weird. I promise. But I figure if the Word of God is alive and active, then it sure doesn't hurt anything to put it near my kids as they sleep and dream. And I didn't make a big deal out of it either. In fact, my kids didn't notice that there was paper taped to their beds for at least another year. I wish I could tell you that our problems went away after I started all of this. But that's not real life. And that's not the promise of the Gospel either. There is still deep and tough work that needs to be done on a daily basis while my kids are awake. My boys are still very much boys - full of testosterone and hormones. They still fight. They can be rude and immature and selfish. They are far from perfect. But so am I. The difference now is that I am armed; I have some truth I can go into battle with. Some Scriptures to declare over them, to them, and even have near them when they are sleeping. After I shared all of this, my girlfriends liked this idea. And I thought maybe it could help a few other moms out there too. And while we do have a little girl now, for so long my heart was tied to other boy moms. We'd share the joys, the baffling surprises, the fears, and the bathroom-cleaning skills that only other boy moms can even remotely understand. So this one's for you friends. For those mama's raising one or more sons, here's a free little printable for you with some of the Scriptures I regularly pray over my boys. There are many, many more that you can (and should!) pray over your sons, but this is a simple start. Cut these verses out, write your son's name in the blanks, and do as you wish with them. You can do as I did and tape them to the bottom of his bed. If that's too weird for you, just put them somewhere that you'll regularly see them so you can pray these verses over him. And finally, I want to encourage you. This work we have set before us - raising the next generation of Godly men - it is no small task. I pray that in the tough times, on the long days, and in the midst of what seems like endless loud wrestling matches, the Lord will breathe fresh life into you. That when you feel weak, he'll strengthen you. That when the world threatens to choke out the truth you are daily trying to impart to your sons, God will cause you to stand resolutely on the promises of His Word. Thanks for stopping by! Subscribe here and you'll never miss a post.